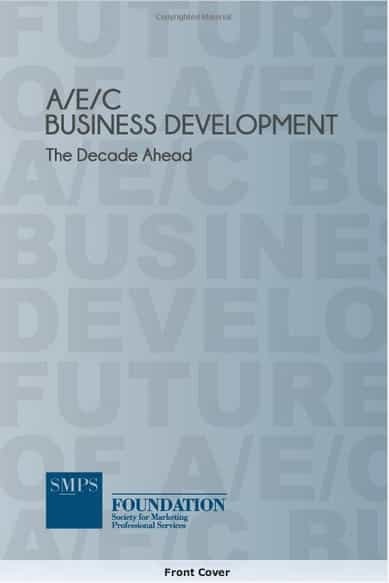 The SMPS Foundation’s book, A/E/C Business Development: The Decade Ahead, is not light reading, but (even though I received it at Disney World in Orlando), you really shouldn’t be expecting anything too light when you are discussing major civil and infrastructure purchasing decisions. Consumer psychology concepts certainly have some relevance when you are trying to win multi-million school, hospital, shopping centre, industrial or toll-highway projects, but you won’t get far with a superficial nod to the technical challenges and a glib, canned sales package here. Buyers are not interested in order takers. Business developers must understand the buyer’s company or institution and industry. The future for non-technical business developers is questionable. Buyers want you to innovate — and help them innovate in the process. Buyers are experimenting — but not taking big chances — with project delivery. Full-service isn’t what it used to be. Reputation and references are still the keys to success. Focusing on the buyer’s specific project wins the day. 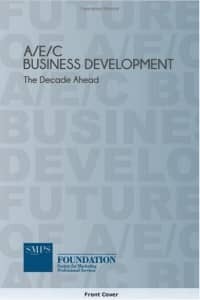 A/E/C firms that offer the most value often go far beyond just design and construction services. Each point here has its own reasoning and elaboration, backed up by specific interviews, and is probably worthy of a specific blog posting. (For now, I’ll encourage you to purchase the book to get to that level of detail.) I think you would do well to include these indicators in your “go/no go” matrix check-lists — assigning weighted points to each of the themes, and determining your threshold score for success. You could make this meaningful by completing a review of previous pursuits, adding up your scores for each and then determining the success/failure ratio. If you are a competent rainmaker, you’ll do far better than any non-technical business-developer. Real professional credentials and experience carry a lot of weight. If you are truly an architect or engineer and have professional certification and can sell, you’ll always be in demand. Thoughtful, individualized approaches to actual client needs lead to success; boilerplate gunk fails. And you cannot achieve this thoughtful approach without having a real understanding of the clients, current or potential. So you’ll need to know them well, generally, long before the RFP is published. This in part explains why local professionals have an advantage and validates my belief that, in the business-to-business environment, relevant client-focused association membership (and participation at the committee and board level) is vital for business development success.